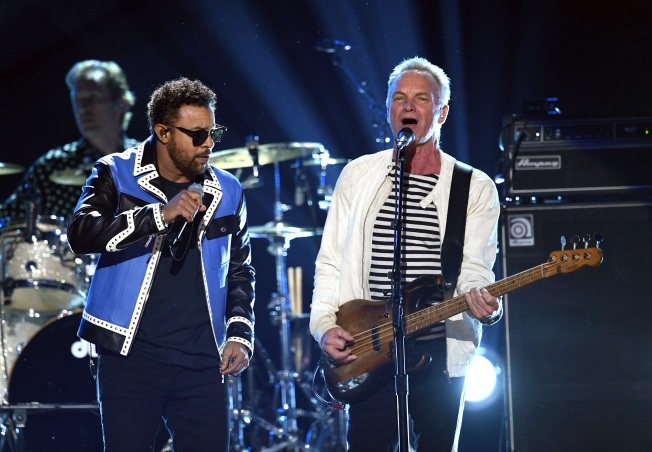 Shaggy (pictured left) and Sting (both shown here performing at the 60th Annual Grammy Awards on Jan. 28 in NYC) stop into Harrah's Resort SoCal this fall. I’m so happy, I can’t stop crying: Sting and his new collaboration partner, Shaggy, are bringing their talents to Harrah’s Resort SoCal on Tuesday, Oct. 16! The pair, both multi-platinum, award-winning icons in their own right -- Sting (born Gordon Matthew Thomas Sumner) as a pop/rock legend from his days fronting the Police and for his luminous solo career, and Shaggy (Orville Richard Burrell) as one of reggae-fusion/dancehall/hip-hop’s most commercially successful artists of all time -- are capping off their upcoming North American co-headlining club tour with a stop right here in San Diego. Tickets for their Oct. 16 Harrahs Resort SoCal show go on sale on Friday, July 13, at 10 a.m. PST at this link. Sting fan club members can purchase pre-sale tickets now (there are several pre-sale options available, go here for more information). The tour, which follows with the recent release of the duo’s recent island-flavored record, will also feature the two artists performing each other’s most celebrated hits (like “Every Breath You Take,” “Englishman in New York,” “Message in a Bottle,” “It Wasn’t Me,” “Mr. Boombastic” and “Angel”). Unsurprisingly, their new single, “Don’t Make Me Wait,” debuted at No. 1 on the Billboard Digital Reggae Singles chart on its release. It’s not often that Sting or Shaggy perform in town (has it really been eight years since Sting's played San Diego? ), so to be able to catch both of them at one show is an amazing opportunity. How's the saying go? If you love somebody...get them tickets.